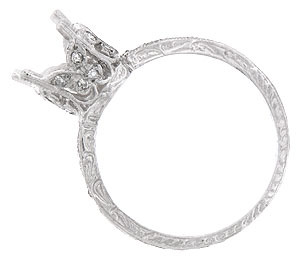 Round, faceted diamonds are set into the shoulders of this glittering antique style engagement ring mounting. 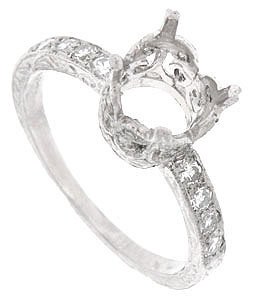 The crown shaped head of the mounting is pierced with a delicate filigree and set with additional diamonds. Organic engraving covers the rings sides. It comes in 1, 2, and 3 carat diamond sizes. The wedding ring mounting measures 7.17 mm in width. Size 6 1/2. We can re-size.